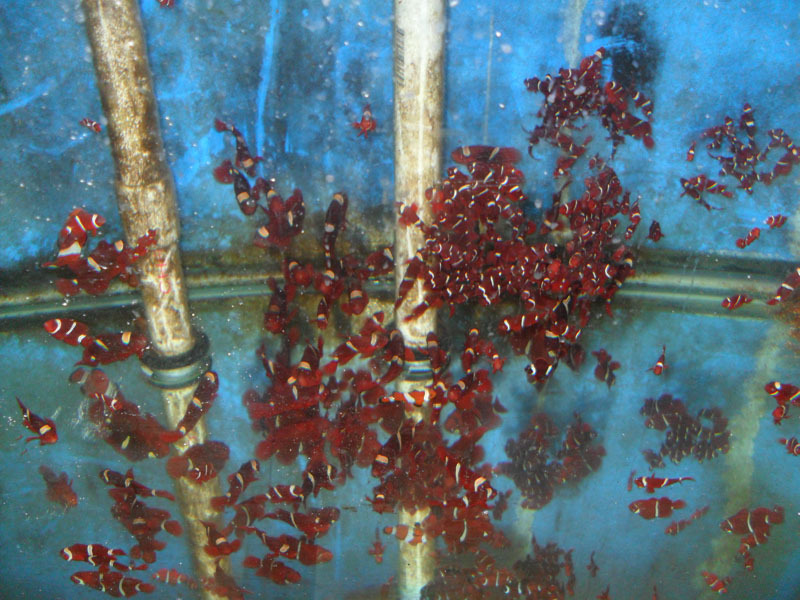 Subfamily Amphiprioninae, the clownfishes, is a diverse group. It is divided into six species complexes, including the Clarkii Complex, the Skunk Complex, the Tomato Complex, the Saddleback Complex, the Percula Complex, and the maroons. In terms of number of member species, the latter two are the smallest; indeed, with only two and one member each respectively, neither is (strictly speaking) really even a complex. The Percula Complex (Amphiprion ocellaris and Amphiprion percula) and the maroons (Premnas biaculeatus) are together the subject of this discussion; the other four complexes have each received attention here in earlier parts of this series. The two are presented here together on account of their superficial similarities, as well as their apparently very similar lineages. 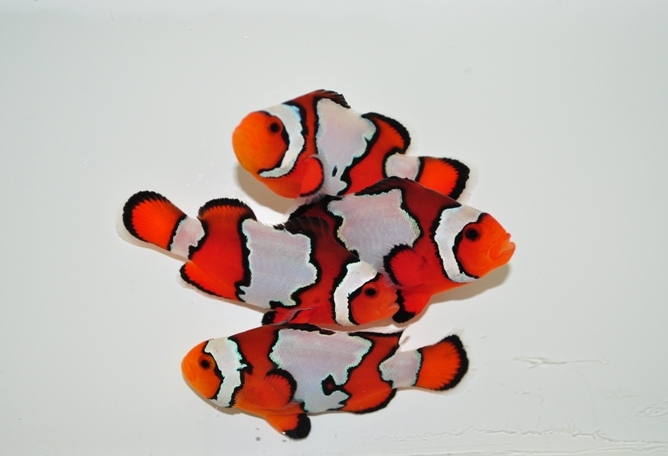 These three species have for long been among the best-represented members of the subfamily within the ornamental fish trade. Their likenesses–particularly that of Amphiprion ocellaris–frequently serve as icons for anything and everything marine, and are recognized even by those who have never owned an aquarium. They have lured countless individuals into the hobby, and continue to command the interest of even the most advanced aquarists. Perhaps most importantly, they stand out as being among the first marine aquarium fishes to be successfully reared in captivity. 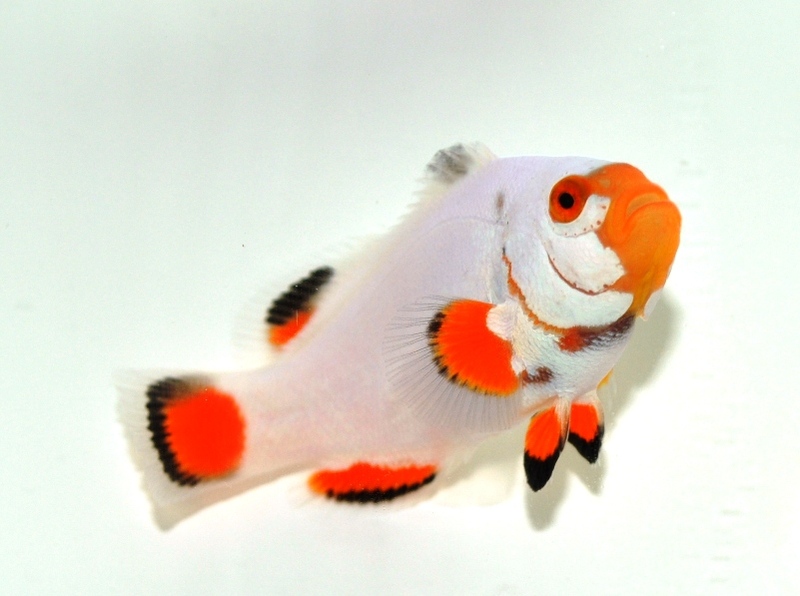 It is truly difficult to overstate how important these distinctive fishes have been, and are, to the ornamental fish trade. Premnas biaculeatus, Amphiprion ocellaris, and Amphiprion percula will likely retain a high demand in the trade as new color morphs continue to be developed; considerable work has already been done in the selective breeding of the latter two species. 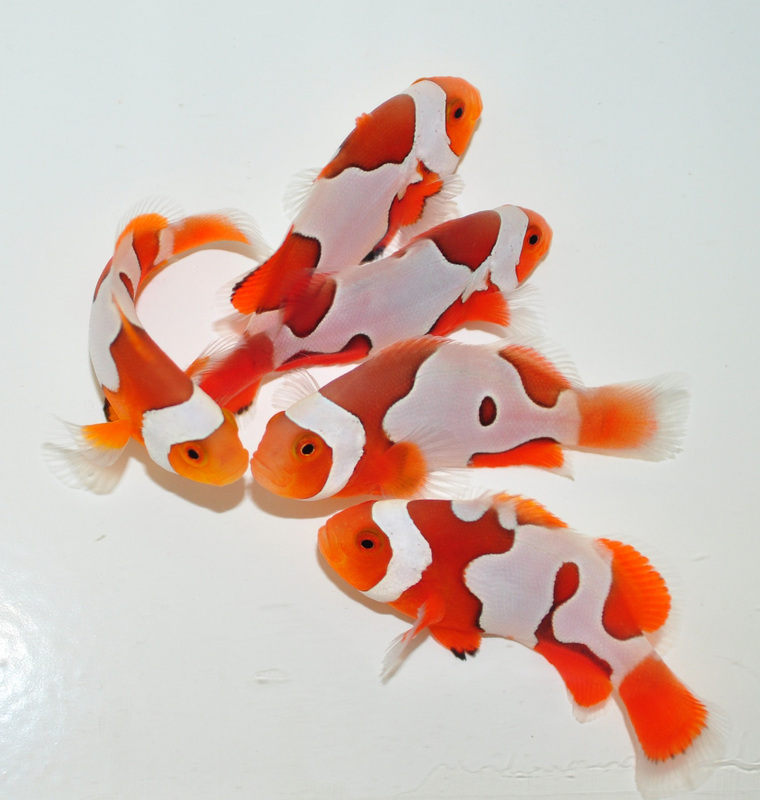 Some aquarists prize these novel varieties (which often bear exaggerated desirable traits) and are increasingly willing to pay premium prices for well-bred specimens. Then again, other aquarists prefer only “wild-type” specimens and view most aberrant color forms as unnatural, if not flawed. In point of fact, many of the traits we see in “designer” varieties can be observed, at least to some degree, within wild populations. Certain differences between the two complexes are noteworthy. Species in the Percula Complex are among the physically smallest members of the subfamily, while the maroons are among the largest; moreover, the former is relatively peaceful while the latter is notorious for its pugnacity. Still, similarities between the two–most notably with respect to body shape and swimming habit–are striking. Many fish biologists and many fish enthusiasts alike have held that the maroons are closely related to the Percula Complex species. Recent work using molecular phylogenetic analysis supports this position, even while calling longstanding notions about the nature of this relation into question. 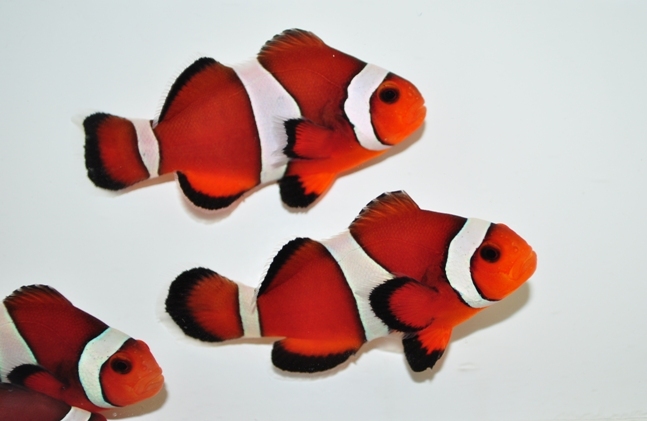 Results from these investigations suggest that these three species are very similar to the ancestral clownfishes. This is particularly surprising in that they certainly appear to be more derived than, say, members of the Tomato Complex, which bear a greater morphological resemblance to their damselfish cousins and are more generalistic in their associations with host anemone species. Being as results from these studies indicate that Amphiprion ocellaris and Amphiprion percula are more closely related to the maroons than they are to the rest of the subfamily, it really may be more appropriate to assign them to the genus Premnas. Here, however, they will be presented in line with conventional taxonomy. 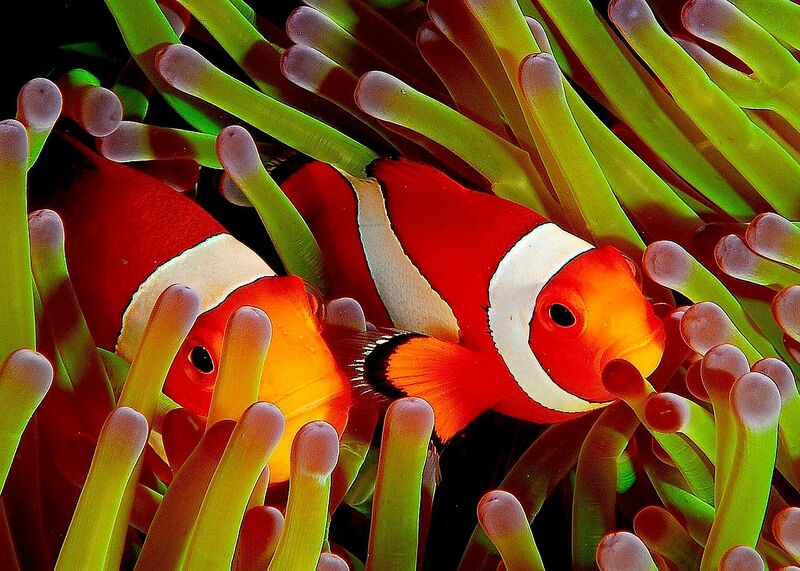 The common clownfish occurs in calm, shallow, reef-associated waters throughout the Indo-West Pacific Ocean from Southeast Asia to northwestern Australia (tropical). It is typically associated with the sea anemone species Heteractis magnifica, Stichodactyla gigantea, and Stichodactyla mertensii. One designation for the so-called common clownfish, false percula clownfish, serves as a great example of how unnecessarily confusing common names can be. Though it is a fairly hardy aquarium fish, it has earned a reputation as a poor shipper. It is distinguished by (usually) having thin, black edging around its bands and by possessing 10-11 spines in the first dorsal fin.It reaches a maximum length of 11 cm. One of the most cited examples of symbiosis is that of Amphiprion ocellaris and its sea anemone hosts. Photo by Jenny Huang. 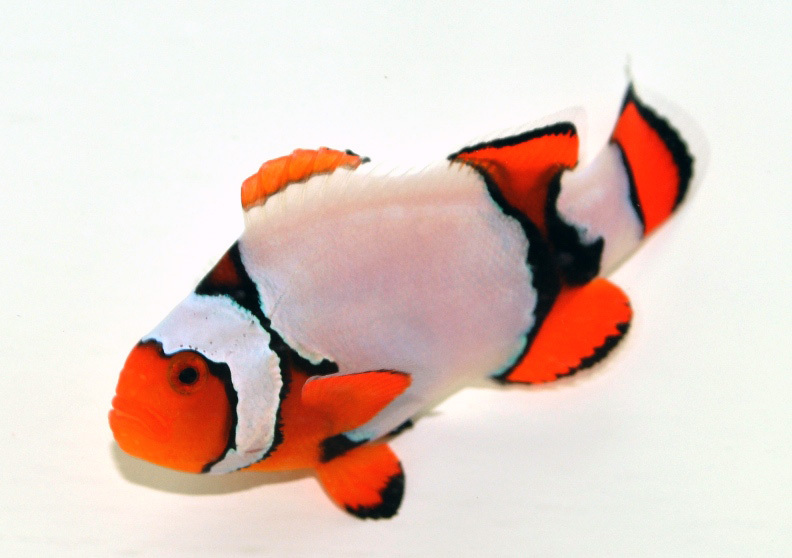 Amphiprion ocellaris (orange). Photo by www.sustainableaquatics.com. Amphiprion ocellaris (fancy snow). Photo by www.sustainableaquatics.com. Amphiprion ocellaris (vivid fancy). Photo by www.sustainableaquatics.com. 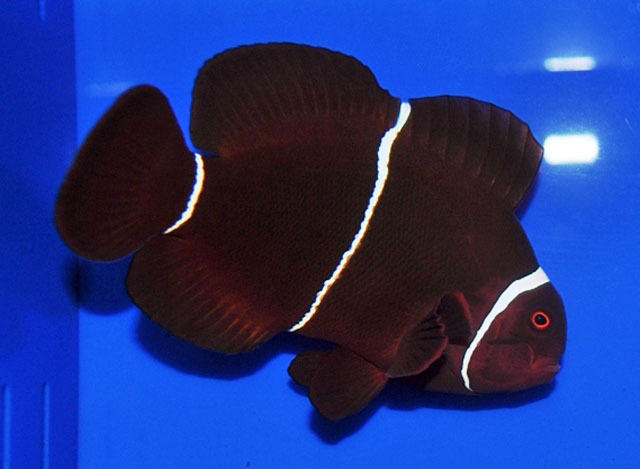 Amphiprion ocellaris (mocha). Photo by www.sustainableaquatics.com. Amphiprion ocellaris (color-changing). Photo by www.sustainableaquatics.com. Amphiprion ocellaris (SA white). Photo by Kenneth Wingerter. 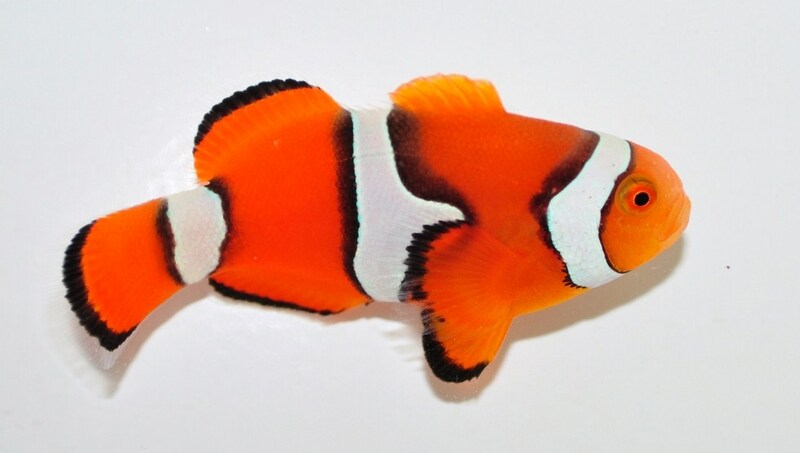 A gorgeous hypomelanistic variety (above) of Amphiprion ocellaris. Photo by Kenneth Wingerter. 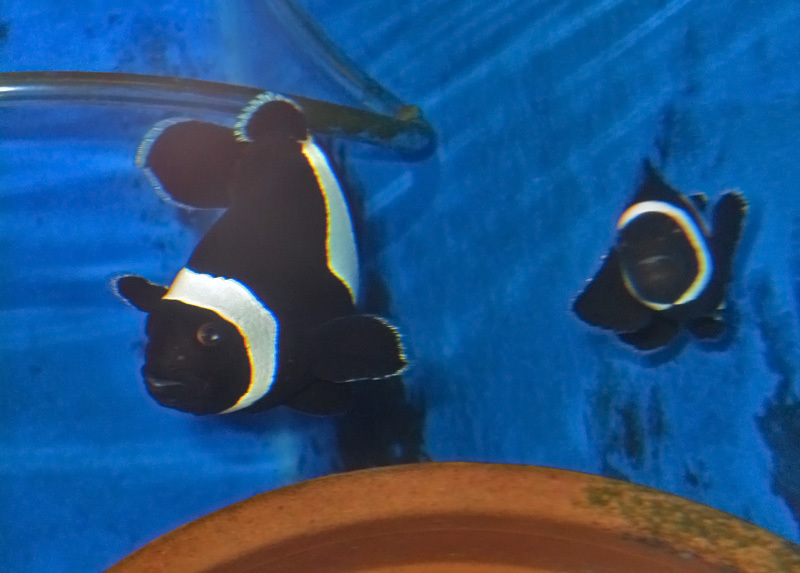 Amphiprion ocellaris (black). Photo by Kenneth Wingerter. The orange clownfish occurs in lagoons and seaward coral reefs in the Western Pacific Ocean from the Great Barrier Reef to the Solomon Islands (tropical). It is typically associated with the sea anemone species Heteractis crispa, Heteractis magnifica, and Stichodactyla gigantea. Though it generally adapts well to captivity, it can be intolerant of suboptimal water conditions. It is distinguished by (usually) having thick, black edging around its bands and by possessing 9-10 spines in the first dorsal fin. It reaches a maximum length of 11 cm. Amphiprion percula. Photo by www.sustainableaquatics.com. 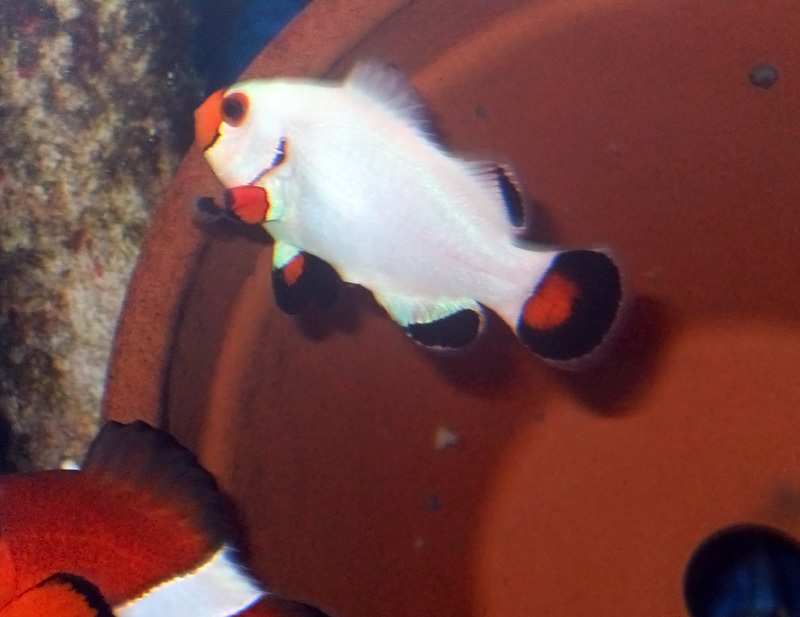 Amphiprion ocellaris x percula (snow onyx). Photo by www.sustainableaquatics.com. Amphiprion percula (picasso). Photo by www.sustainableaquatics.com. Amphiprion percula (platinum). Photo by www.sustainableaquatics.com. 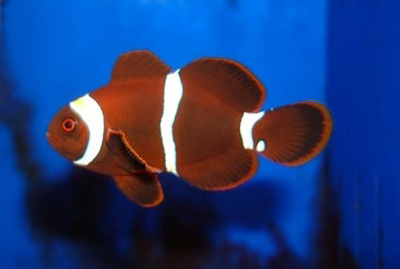 The maroon clownfish occurs in lagoons and protected coastal waters throughout the Indo-West Pacific region (tropical). While the white-stripe strain is widely distributed, the gold-stripe strain appears to be restricted to Sumatra. It is typically associated with the sea anemone species Entacmaea quadricolor. It is distinguished by its maroon to mahogany red adult coloration and its set of prominent preopercular spines. 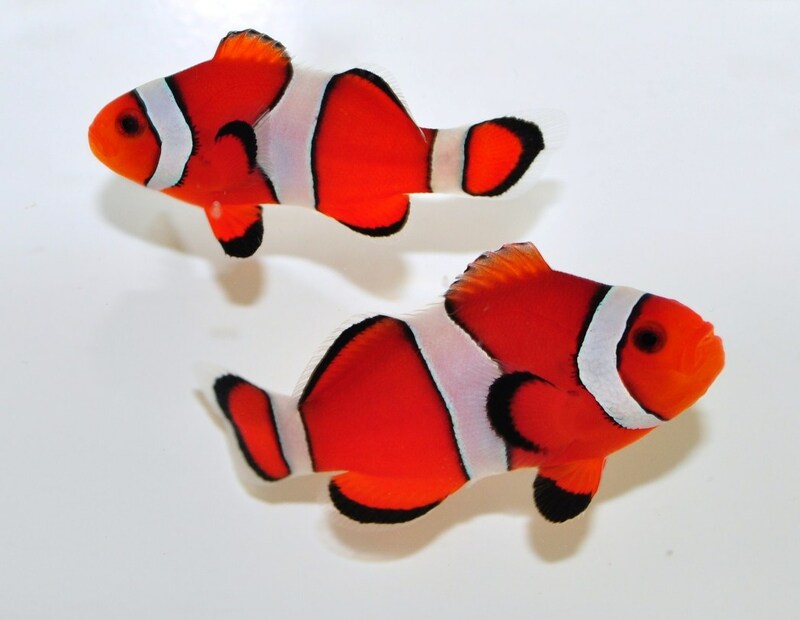 It can be vicious towards other clownfish, and should therefore be kept singly, if not in established pairs; pairings are best made by introducing a very large individual to a tank housing a much smaller individual. Females grow considerably larger than males. The maroon clownfish can reach lengths of over 17 cm. 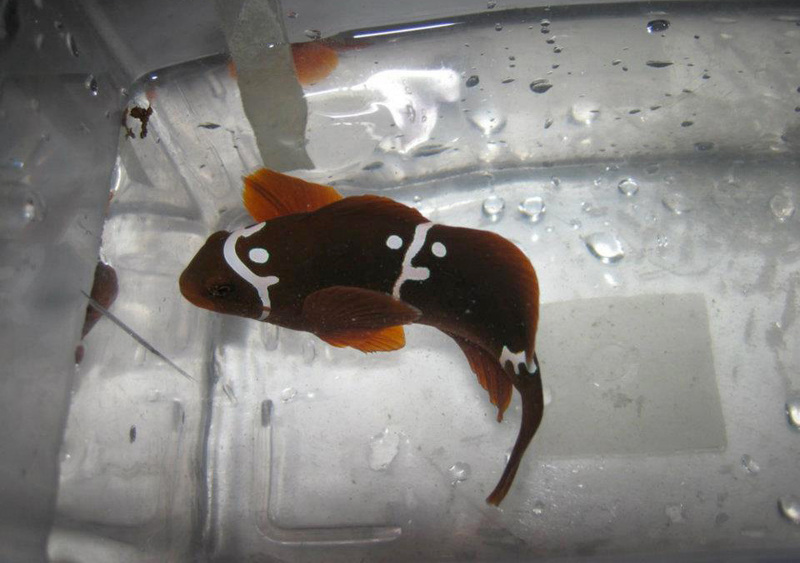 Juvenile and male Premnas biaculeatus tend to be bright red, darkening as they age and become females. Photo by Jenny Huang. Premnas biaculeatus (white-stripe). Photo by www.sustainableaquatics.com. 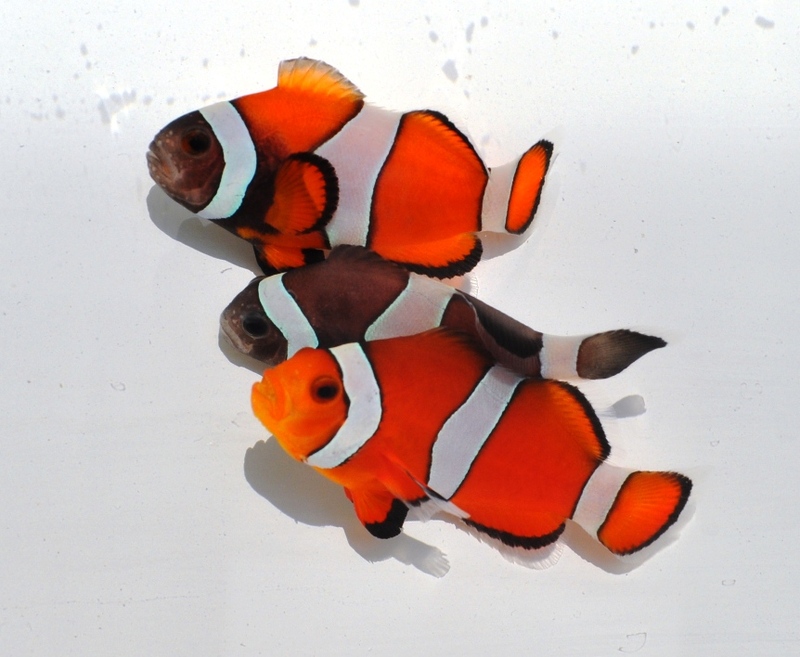 The bands of juvenile gold-stripe maroon clownfish are often whitish, yellowing as the individual ages. Photo by www.sustainableaquatics.com. 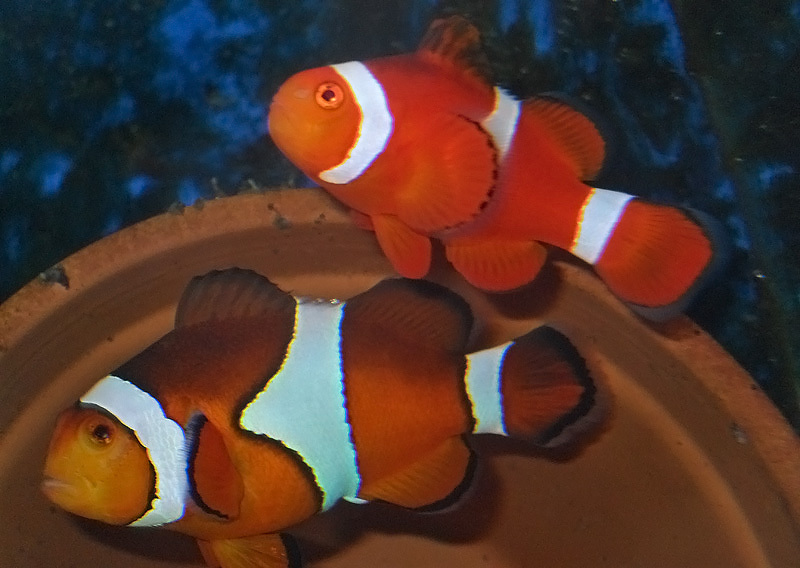 Once somewhat rare and expensive, the gold-stripe maroon clownfish is now quite common owing to commercial aquaculture. Photo by Kenneth Wingerter. Aberrant striping is not uncommon even among wild Premnas biaculeatus. Photo by www.ecoaquariumspng.com. 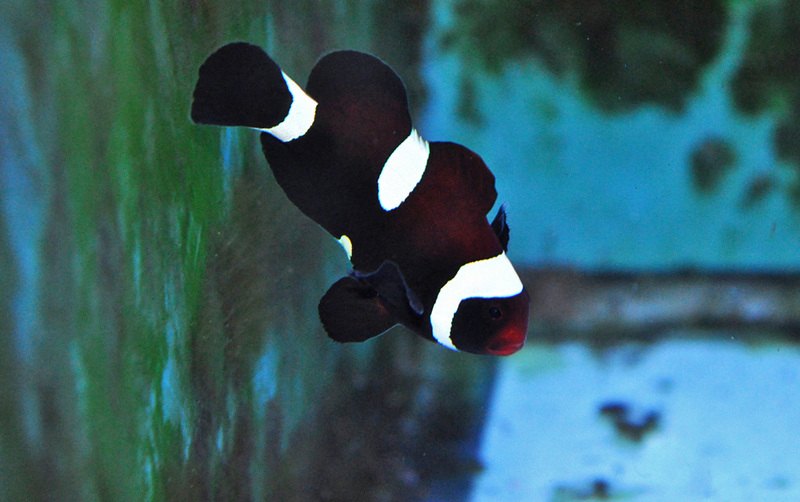 The cocoa clownfish, a very attractive hybrid of Amphiprion ocellaris and Premnas biaculeatus. Photo by Chris Turnier. 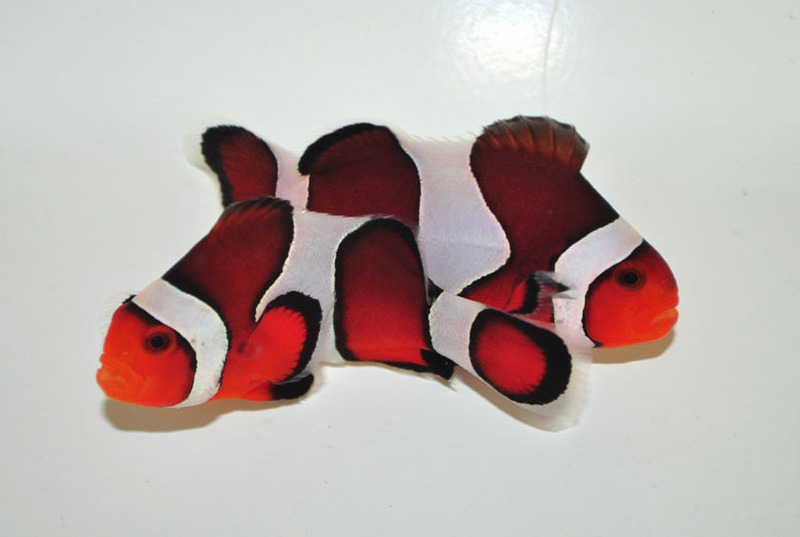 It pretty much goes without saying that the common, orange, and maroon clownfish are well known and well represented in the marine aquarium hobby. Tank-bred specimens are now widely available in trade; most agree that these are far easier to keep than their wild counterparts. 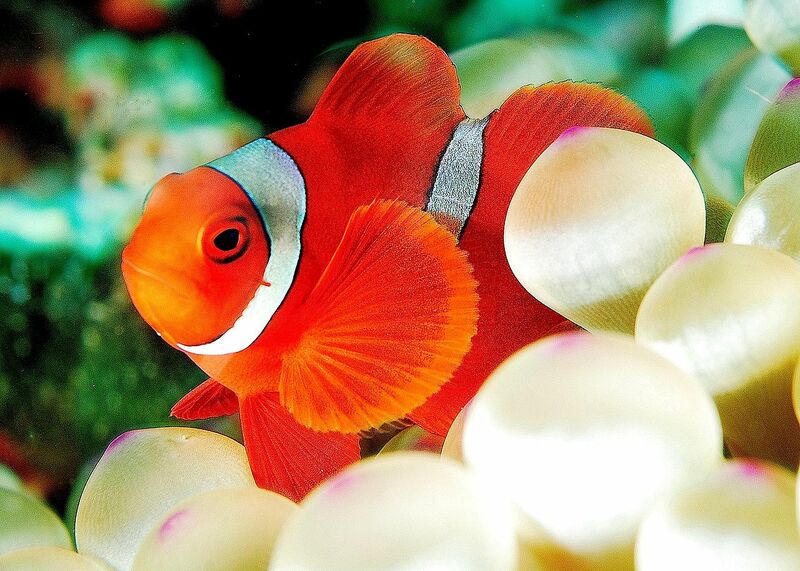 Especially in the case of the common and orange clownfish, a wide variety of color forms are yet being developed. Ones preference for one of these forms, or of strictly wild-type forms, is really only a matter of personal predilection. Certainly, newer (and bolder) varieties are forthcoming. With the commercial hatchery production of these fishes now well underway, it is perhaps only a matter of time until maroons come in “fantail,” “pearlscale,” and “bubble-eye.” That notwithstanding, the typical forms we have always admired are no more likely than red roses to lose their strong popular appeal. Elliott, J. K., S. C. Lougheed, B. Bateman, L. K. McPhee and P. T. Boag. “Molecular Phylogenetic Evidence for the Evolution of Specialization in Anemonefishes.” Proceedings: Biological Sciences Vol. 266, No. 1420 (Apr. 7, 1999), pp. 677-685.